Regular popper-uppers The Art of Dining are back with another impressive venue and concept, this time at The National Trust's Fenton House in Hampstead, with live performance and excellent food as ever, spread over six nights in mid July. 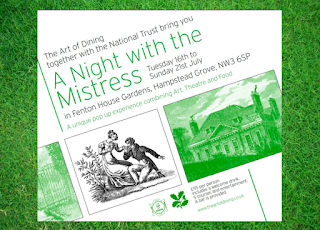 "Taking place on 16th – 21st July 2013 in the house and gardens of Fenton House, a beguiling National Trust property in Hampstead, this pop up restaurant involves an exceptional mix of design, food and entertainment on the theme of decadence, edible gardens and naughty behaviour! Guests will be welcomed with a drink in Fenton House and an optional tour of its treasures, before being lead to a secluded spot outdoors where a 5 course feast inspired by the picturesque garden will be laid. The Mistress of the house Dora Jordan, whose portraits hang throughout Fenton House, will serenade guests with songs from her latest role in theatre. On entering the dining tent guests will be transported to an altogether other-worldly setting: natural, intimate and warm; full of foliage and flowers, taxidermy and bird song, all intermingled with an air of regency style."